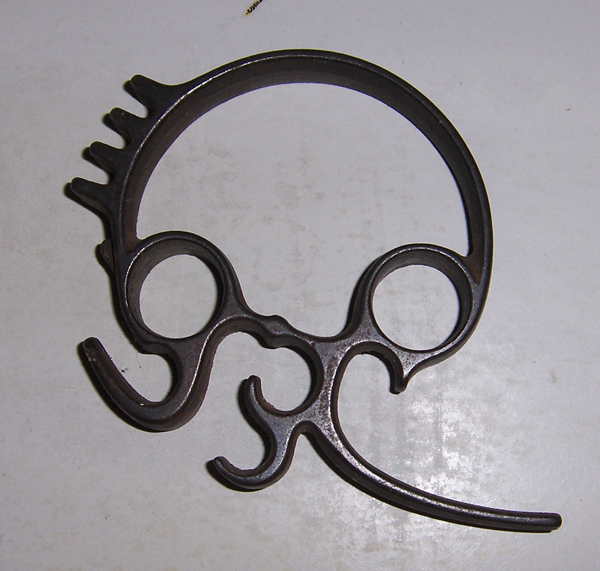 Got the 3rd one - it's a turkey lifter. 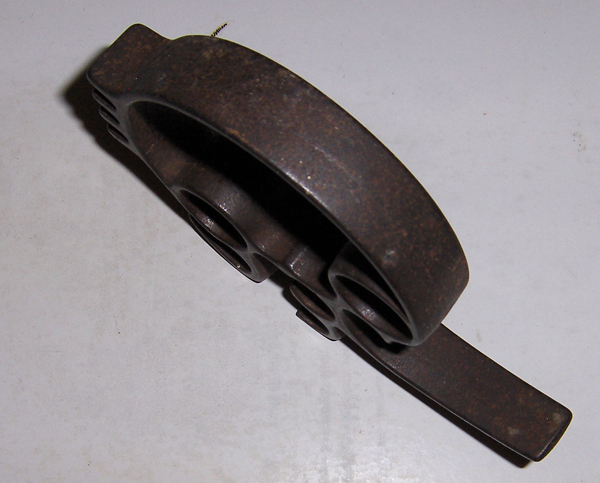 First one some sort of bean cutter? Second one looks like it's for grating turtles! Forth would be a pastry/candy cutter. The first one is some kind of slicer. You can see the blade. But what do you slice in it? Carrots? The shape of the thing that holds whatever is being sliced is round, and the circumference is not so large, so it makes me think carrots. Doesn't look big enough for potatoes. I thought the second one might be a Japanese ginger grater, then I noticed it was 12" long! Could it be a horseradish grater? (Would anyone want to get that close to horseradish when grating it?) I've never seen horseradish in real life, but in my imagination it's quite large. Horseradish root is like a really big carrot or parsnip - so that sounds like a good guess. Possibly a truffle shaver for the 1st. The turtle one could be a coconut grater. The "Aligrator" is used for coconuts (the tail part) but also for grating cinnamon, and other dry or hard roots, galangal, ginger, tumeric, etc., while the fresh roots are usually pounded in a mortar. It is quite heavy. The turkey lifter is also a ham lifter and is great for turning other heavy chunks of meat that are awkward to handle when hot. I have two and use them a lot for things on the barbecue as well as oven-roasted meats. It came from England along with tons of other kitchen and household stuff in 1919 so I know it is close to 100 years old. It has a wooden pusher that has been stuck where I can't find it, for the moment. I have used it, but not for many years as it takes a strong arm and perhaps a bit of anger to really work it properly. I can vividly recall my grandpa's cook operating the thing when I was about nine or ten. The peels were separated from the fruit (which was chopped and cooked separately and the pulp strained out) stacked and rolled then shoved into the maw of the cutter and rammed against the cutting blade so the peel was finely shredded. The final product was thin strands of peel in clear jewel-toned jelly. The forth one is a dough/pastry cutter and is actually adjustable, although it takes time to loosen the screws and move the blades. I use it for cutting large slabs of dough or puff pastry into strips that are then cross cut to make squares, such as for apple turnovers. I have one of the accordion-type adjustable ones for smaller jobs but this one is easier to use for the big jobs. My mom sent it to me when she closed her bakery in 1979 as I wanted a memento from my first ever job. The forth one is a dough/pastry cutter and is actually adjustable, although it takes time to loosen the screws and move the blades. I use it for cutting large slabs of dough into strips that are then cross cut to make squares. Oh my god, I've been looking for a marmalade cutter - a few years ago I kept asking everyone going to england to see it they could find me one - they all came back with zesters for me - I've now got a drawer full of zesters. Now I know what to look for! I have seen them on ebay from time to time some not identified as marmalade cutters. Several manufacturers made them but I think that like so many metal objects that had limited use, were scrapped for the war effort during WWII. I was just looking at a couple on e-bay great britain - I'll keep an eye out. 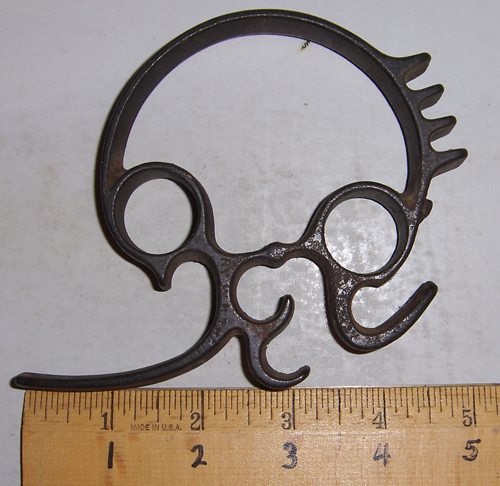 I saw one a few months back listed as a "sausage slicer"
The item was located in New Jersey! INcidentally, if you find one without the pusher - the shaft size is just a tiny bit larger than a standard wood closet rod or dowel. I'm sure one could be easily fashioned. Is it just to get the slivers finer than one could easily achieve with a knife? This was originally invented in late Victorian times when there were hundreds of kitchen gadgets and implements for specific purposes - lots of servants - that were supposed to do a particular job with greater efficiency. This creates extremely fine shreds of peel that are difficult to achieve uniformly with a knife and we are not talking about small batches. 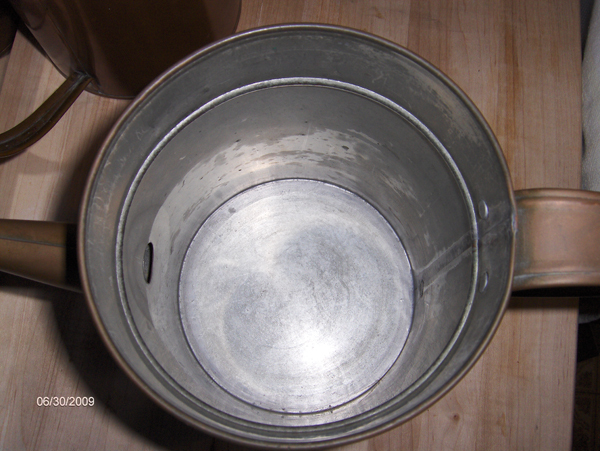 My grandpa's cook would fill a huge jam pan (round bottom, holds about 22 quarts easily). 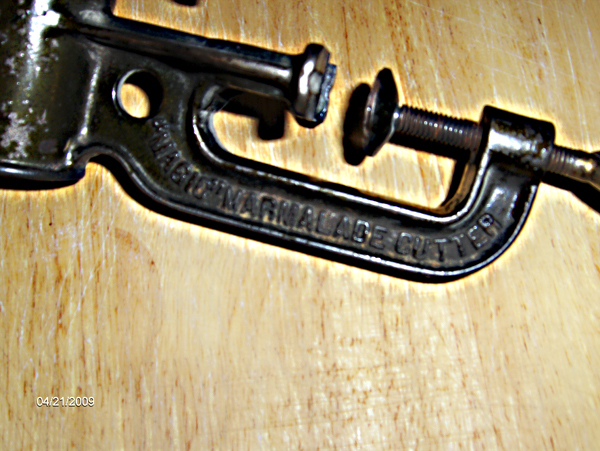 I am now the proud owner of a cast iron marmalade slicer - it arrived in the mail from England today. I was the only bidder on e-bay and got it for an extremely reasonable price. The shipping was not outrageous for something that heavy either. The blade could use a little cleaning - a bit rusty on one side. I wonder if there is any sort of blade made these days that could be used to replace it. I've never looked for a replacement blade. I've taken the blade off and taken it to my local knife shop to have it sharpened. The blade man there is a wizard at handling these odd bits. I have an antique draw-knife that i use to take the skin off big watermelons ( for pickles) and he puts an edge on it that could shave a peach. If I needed a new blade, I would ask him if he could cut down a knife blade for the cutter. I don't think it would be a difficult task. (While scarcely in the same category as an antique marmalade cutter), Imagine my surprise in trying to find out just what I had bought in a second hand store in Moab to discover that this item was a bona fide Collectible. Almost $20 for a two-stacker...and I have a FOUR-stacker. 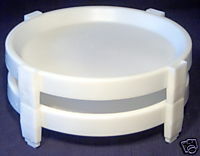 Tupperware Collectibles on eBay, Divide-a-Rack. I had never seen one before and thought it looked usual for ferrying short stuff, like pies and bonbons, from here to there. I must be in Tupperware Heaven. I love Tupperware and have so much I can't keep track of all of it. Back in the '70s and early '80s I lived next door to a regional distributor who regularly asked for my help with catering sales "parties" not only for consumers but also for her subsidiary distributors. In addition to paying me for the food and my services, she gave me a lot of Tupperware, many pieces were special items, not made for general sales but as gifts for the person holding the party. I have a dozen of the butter dishes that are perfect for the 1/2 pound slabs of Kerrygold butter and I have four of the large ones that hold a 1-pound block of butter or cheese. 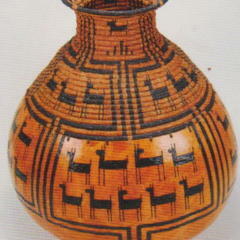 I especially like it because it ages well and containers that are thirty years old are still in good condition. They come in several different sizes. 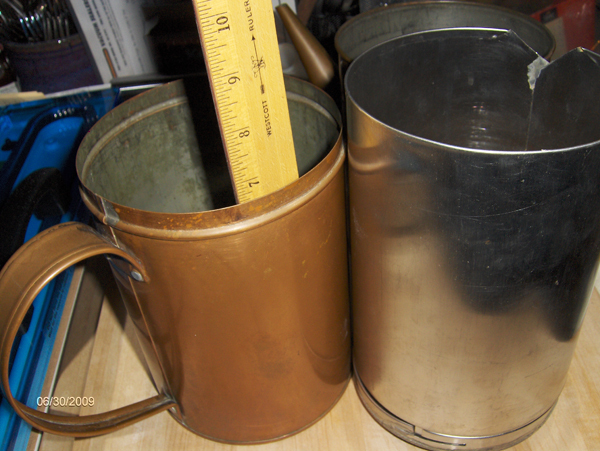 This one holds two quarts of water to the flange line on the part with the spout. I also have a two-cup model but can't find it at present. There are three screens in the bottom of the insert with a strap between them to stabilize the structure. Maybe for making tea? 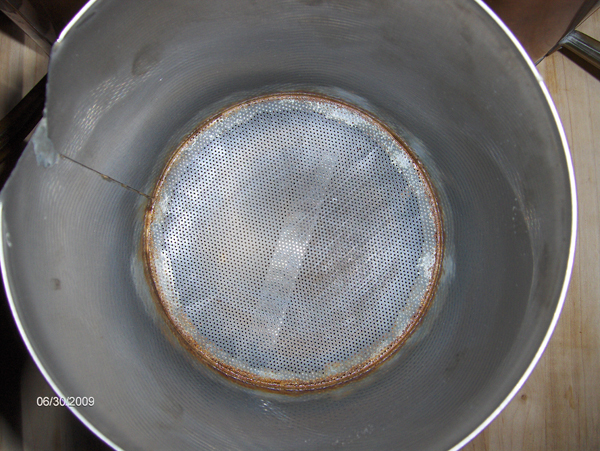 The strainer was to keep the tea leaves from being poured out? The vessel is a topsy-turvy coffee brewer, ca. 1930. It is made in France but I don't know the name of it in French. 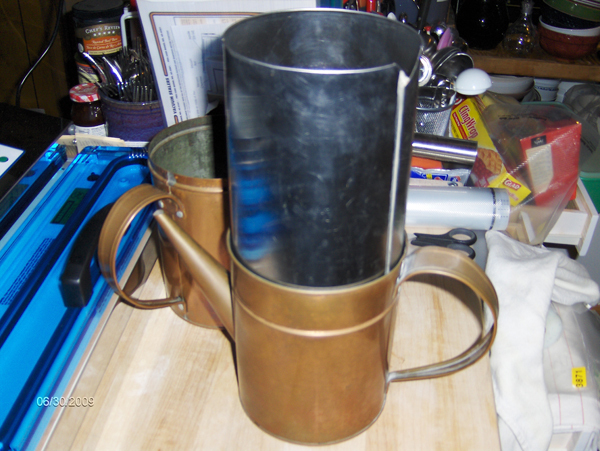 The water and the coffee grounds are placed in the part without the spout and the spouted part, with the insert placed upside-down over it, it fits tightly. 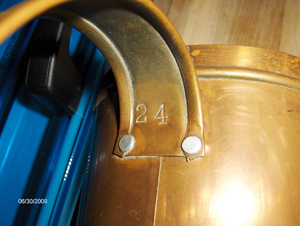 When the water boils (steam will come out of the inverted spout) the vessel is removed from the heat, allowed to brew for the appropriate time and then the entire thing inverted. The top part can then be removed to see when the water has drained away from the grounds. The brew can then be transferred to a coffee server - usually ceramic or even silver, usually in a set with a matching teapot. This one was given to me many years ago by a dear friend who used to rent vintage items to movie studios. I don't know if this was ever used in a film, but I think it is rather unique. 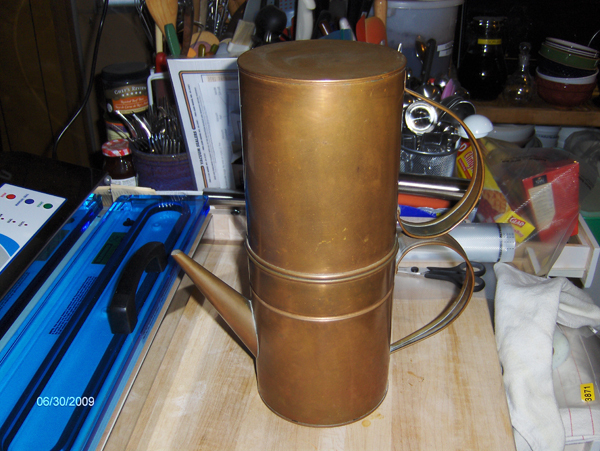 He gave it to me when he became ill because he knew I collected copper cookware and would treasure it. 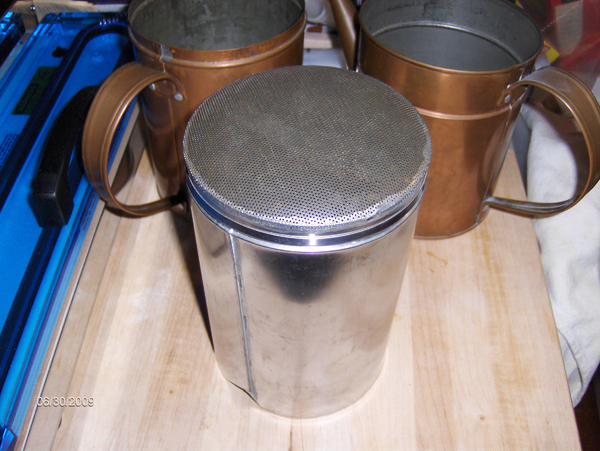 I do have a much smaller one that is not as well made and has only a single layer of perforated metal to strain the coffee and it doesn't do a very good job. While the 'gadget' is not unusual or unknown, its circumstances certainly are. Yesterday at our local 'transfer station', while the DH was unloading our detritus, I found a two-handled, round-bottomed carbon steel wok in the station shed. This shed holds things that folks no longer want but are willing to leave for others and the finds can be wondrous. So I found this wok, never used, in its original plastic bag...a kind of plastic you never see anymore...with much Chinese writing on it and in English: "Hand-made Steel Caldron (sic) Made in People's Republic of China". Much of the plastic is melted/fused/? to the metal and it's going to be work to get it off. I am curious as to how old it might be with that on wording on it. And I'm bumping up this topic as I came across this odd item while digging through a box of stuff sent to me by one of my cousins who still lives in Kentucky and has held onto a lot of things used at the old home place when I was a child. Any guesses as to the uses to which it was put? Should work on prying lids off things. Here it is with a ruler. Kerry has one function correct! Would make an impressive set of brass knuckles too!